The worry tree helps us effectively deal with worrying thoughts. Worry is a particular problem in Generalised Anxiety Disorder (GAD). We can spend many hours a day worrying about anything and everything, and that worry is often not helpful, in spite of what we might believe. See the GAD page. The worry tree helps us deal with Type 1 worries which are the worrying thoughts that seem to happen all the time. Hypothetical situations are those "what if...?" thoughts about some terrible event that might happen. "My partner is late home from work - what if they've had a serious road accident?" "The ozone layer has holes - what if the end of the world happens soon?" "There's a traffic jam - what if I lose my job when I'm late?" These thoughts are usually followed by imagining what would happen in those worst-case scenarios. 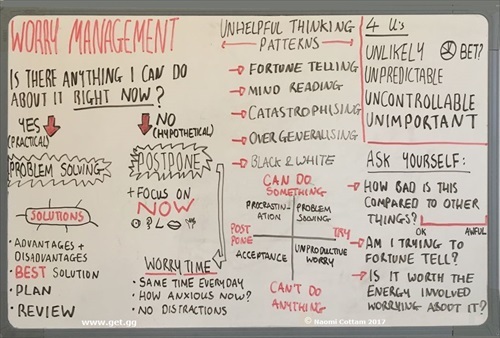 These kind of worries then, cause us a lot of anxiety, when there is perhaps little or nothing we can do about that situation, and we are over-estimating the odds of these things happening. They are an imagined future scenario that will most probably not happen. We might think we're helping by worrying and planning what to do in the even of this feared event happening, but it doesn't happen, so all that time and distress has not been helpful. Current problems are those worries that relate to a real situation, that we CAN do something about. 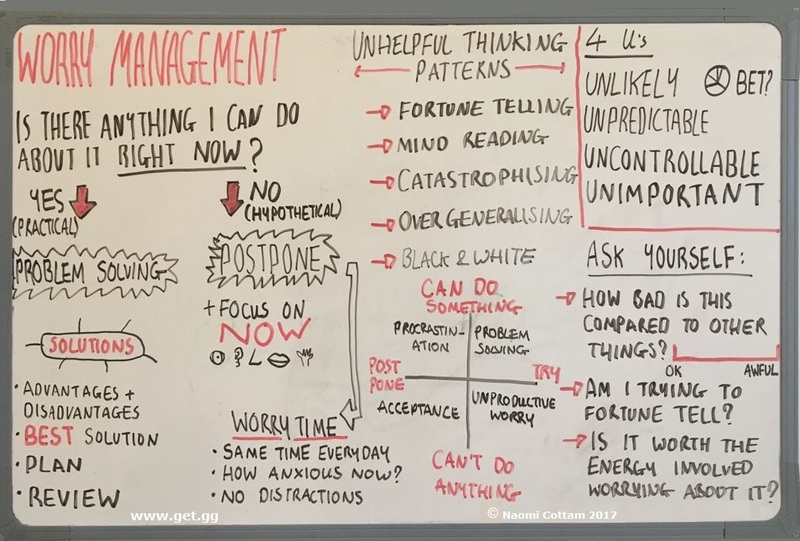 In which case, we can decide what to do, when and how - which will be much more helpful than just continually worrying about it. Ask: "Is this a hypothetical situation or a current problem?" and/or "Can I do something about this?"